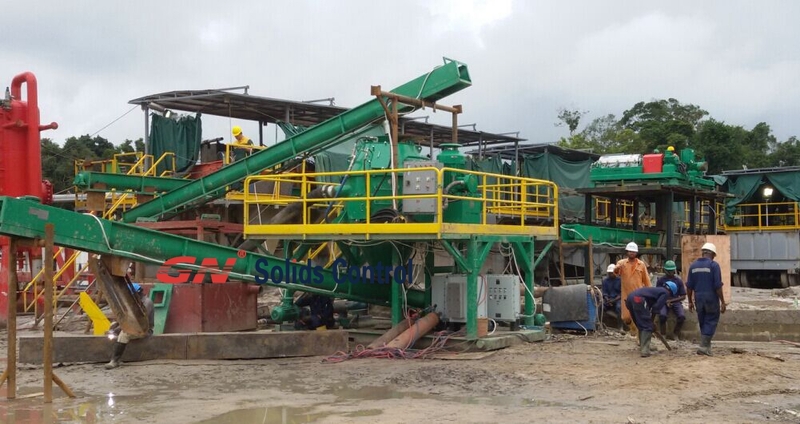 Pitless drilling mud system/ drilling cuttings treatment system is one of the main products for GN solids control, also called no-pit drilling waste management system. It has been a new trend for the oil & gas drilling in the countries which issued new regulations of environmental protection, especially for earth recovery after drilling. GN has provided various solutions for our clients in domestic and international clients for their different requirement, with the best result and reasonable price. Traditional oil drilling will keep the drilling waste discharged from solids control system in a big pond/ pit near the rig. In some drilling sites, there are drilling waste management system to reduce the drilling waste and ship the dry waste by truck, and recycle the useful fluids to prepare for new drilling fluids. In some other sites, there are not drilling cuttings treatment system, they only remain them there, when it is full, they will use a waste truck to ship them to a facility for treating. During the transferring, the fluids waste will spray out and damage the earth nearby. The new trend is to reduce the pit or no pit at the drilling site. The idea is to improve the solids control system efficiency and connect it with drilling waste management system. The dry waste will be collected by screw conveyor continuously and finally transferred to cuttings box. When the cuttings box is full, it will be transferred by the truck as landfill or construction industry. There is no drilling waste hazardous leaved on the ground during the drilling process. Our designed pitless mud system including water based mud treatment and oil based cuttings zero discharge. Pls send us your project details, our sales engineer will give you proper solution. We can both sell you new zero-discharge system and also updated your existing solids control system with adding a drilling cuttings treatment system. « GN economic separation plant for construction machine.